The Conservatoire et Jardin botaniques de la Ville de Genève is a city museum. It hosts one of the world’s largest herbarium and botanical libraries and manages an associated garden. Its goals are to explore the environment worldwide; extract botanical collections and associated data; ensure the conservation of living and fixed collections; perform research based on these collections in the realms of flora, vegetation, and evolution; teach botany; and contribute to the conservation of environment and species. This project is the result of a long-running partnership between the Conservatoire et Jardin botaniques de la Ville de Genève and Jardin Botanico y Zoologico, Paraguay. For the past decade, the Conservatoire et Jardin botaniques de la Ville de Genève (CJB) has cultivated an educational cooperation policy involving many southern-hemisphere countries. The policy recognises that although most well-established botanic gardens are located “outside the belt of tropical biodiversity that encircles the planet”, they have a responsibility to collaborate with tropical botanic gardens which are rich in biodiversity. As a result, CJB currently works with partners in Bolivia, Brazil, Ivory Coast, Burkina Faso, Senegal and Paraguay to improve these botanic gardens’ ability to counter loss of natural and cultural diversity, establish ethnobotanical policy and expand environmental education. Paraguay has experienced some of the world’s highest levels of deforestation in the last fifty years, as a result of forest clearance for timber, coal mining and, more recently, for pasture and the growth of cotton and soya. Amid such destruction, assisting local organisations to protect their country’s rich biodiversity is paramount. Ethnobotany (from “ethnology” - study of culture - and “botany” - study of plants) - the scientific study of the interactions between plants and people. Whether for flavouring maté or treating medical complaints, use of medicinal plants is deeply ingrained in Paraguayan culture. Such plants are the basis of a thriving trade which supports plant gatherers, peasant farmers, street sellers and market traders, with several laboratories and dispensaries exporting the plants as far afield as Argentina and Brazil. An ethnobotanical study in 1996 revealed that, of the 700+ plant species used for traditional medicine in Paraguay, 70% originated from the Asunción region. CJB, together with Asunción Botanical Garden, used this research as the basis of a project to apply ethnobotany to environmental education. Medicinal plants on sale, Asunción. Running for over ten years, the AEPY project is a collaboration between CJB, Asunción Botanical Garden and 29 peasant farmer associations. 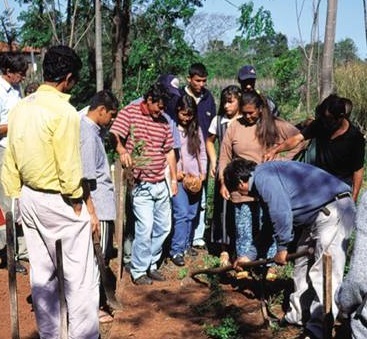 The project improves livelihoods by supporting the domestication and sustainable cultivation of Paraguayan medicinal plants while conserving the region’s natural biodiversity through reforestation and raising conservation awareness. In 2009 the collaboration produced a comprehensive reference work of taxonomic, horticultural, ethnobotanical, conservation and phytopharmaceutical information on Paraguayan medicinal plants. With Swiss Red Cross funding, this manual has been distributed free of charge at markets to peasant farmers, gatherers and retailers. Further to this, the technical education establishment Campotech was set up for young people of school-leaving age from peasant farmer families. Campotech aims to prevent large-scale migration to urban areas by creating professional opportunities for adolescents within their own communities. A further success is the Medicinal Garden housing a living collection of over 500 medicinal plants used in Paraguay, now praised as one of the finest medicinal plant collections in South America. Other project outputs include secondary plant collections at the National University of Asunción and Patino Aregua Ethnobotanical Gardens; several cottage and community gardens; numerous publications, educational resources, television and radio programmes. This project has produced educational resources and establishments which will be an enduring part of Asunción’s botanical and cultural heritage. It successfully supports communities protect their environment and adapt traditional livelihoods to be more resilient and sustainable. 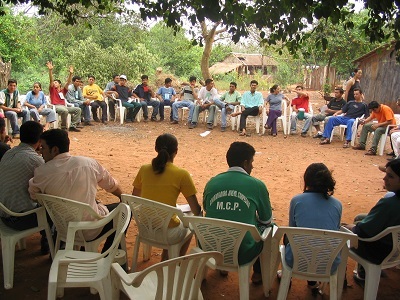 Workshops and courses open to the Paraguayan general public help to spread the project’s ethnobotanical conservation message beyond peasant farmer communities. As well as press coverage in Paraguay, CJB has promoted the project in Geneva through their Cap au Sud exhibition (2002). Children at AEPY educational event. The project is currently in the process of becoming self-sufficient through a new intermediary association, Asociación Ethnobotanica Paraguaya which is championing the project in-country.